We can all be heroes. 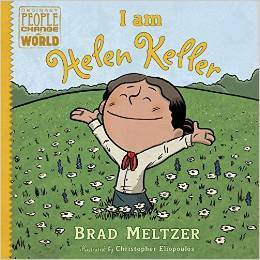 That’s the inspiring message of this New York Times Bestselling picture book biography series from historian and author Brad MeltzerWhen Helen Keller was very young, she got a rare disease that made her deaf and blind. Suddenly, she couldn't see or hear at all, and it was hard for her to communicate with anyone. But when she was six years old, she metWe can all be heroes. That’s the inspiring message of this New York Times Bestselling picture book biography series from historian and author Brad MeltzerWhen Helen Keller was very young, she got a rare disease that made her deaf and blind. Suddenly, she couldn't see or hear at all, and it was hard for her to communicate with anyone. But when she was six years old, she met someone who change her life forever: her teacher, Annie Sullivan. With Miss Sullivan's help, Helen learned how to speak sign language and read Braille. Armed with the ability to express herself, Helen grew up to be come a social activist, leading the fight for people with disabilities and so many other causes. My kid has been very interested in Helen Keller lately and this is my favorite by far. We have also read some about Louis Braille and this is the first book to include Braille letters so that she could feel them. I love the illustrations and it is the perfect amount of information. A picture book biography of Helen Keller and the struggles and triumphs of her life. He takes you from her childhood all the way to her adult life chronicling her disease and miraculous accomplishments. Meltzer does a good job of being simple but thorough in this book. I liked this book a lot. I have always been in awe of Helen Keller and this is a great book to teach kids about her. Great concept for children's biographies. Love the book size and content. Didn't care for comic style text boxes (what are those called?). This is a cute kids book that is based on the life of Helen Keller. The book talks about people who are different and diversity as a whole. I felt it was an excellent read for children. I sit with a couple of kids who are very interested in reading. This happens to be one of the books they selected. The illustrations were good and the kids learned all about Helen Keller. I would definitely recommend to a family or day care facilities, very entertaining. This book is a great biography about Helen Keller. It gives enough detail about her life from when she was a small child, to her getting sick and becoming blind and deaf, and the struggles and accomplishments she achieved. Its interesting to see how she learned how communicate with others with her disability. Theres even a page in the book that has a braille alphabet so you can spell / feel for your name. Not only was this book adorable in text and illustration, it blended the strengths of graphic novels and prose. Informative and witty, it really pulled me in, even though at this point I've read at least 3 or 4 children's biographies of Hellen Keller.I'd recommend for any reader looking to ease into biographies who's a fan of graphic novels or someone who wants to read a quick biography that leaves one inspired. We got this book from the library after seeing it on A Mighty Girl. My 5 year old loved it and pretended to be Hellen Keller, saying she can do even the hardest things! No matter what if she works hard she can do things that people says she can’t. Pretty sure we willend up collecting the I Am series. We love the theme of “Ordinary People Can Change the World”. This is a great introduction to biographies for young kids. Helen Keller's story has always touched and inspired me. When I saw this children's book, I had to get it for my girls, and as I read it to them tonight for the first time, they were both mesmerized and amazed that this was a true story and wanted to learn more about her life. The comic styled illustrations enhanced their engagement in the story and we will probably read this one again and again! Genre: Biography Grade level: K-5Helen Keller was such an inspiring person and the way she came alive in this book was amazing. This book tells all about her life and how she became so successful, even through her struggles. My favorite thing about this book is how there is a page that has actual Braille on it, so children can really see and feel what she experienced when learning to read! Meltz did a terrific job of portraying the life and accomplishments of Helen Keller in a way that children understand. I LOVE that he included Braille for children to see and feel and wrote the story from Keller's point of view. The illustrations are great and the book is packed with useful and interesting information. Meltzer is one of my favorite authors, and I think this series is great. I am a teacher and bought a few of these books to read to my class when reading about these amazing individuals. I think it is a good way to introduce the person before reading something they have written or something more extensive written about them. I look forward to reading more in the series. Keep 'em coming! I am Helen Keller is the perfect mix of story, illustration, and inspiration, which is probably easy to accomplish when working with such a powerful story. I especially like the inclusion of a Braille alphabet. Everything about this book is wonderful. The illustrations are obviously adorable, the text is funny and accessible, and it discusses disability and difference in a positive and engaging way. I loved it, and will be looking out for the rest of the series.